Curious to see the most profitable business catering from home start ups? Take your share of the 7-plus billion dollar catering industry. Starting a home catering business gives you a ton of options. Wedding caterers may have the largest impact on a wedding guests experience. It's all in the quality of the food you make (fresh, of course) and its presentation. This is the key to having a profitable business in catering. There are any number of excellent wedding catering ebooks and print books available to assist you. This business catering from home start up market niche is larger than you think. Nearly 39% of people who purchase kosher food do it not for religious reasons alone but because of the strict standards for cleanliness. Actually, large numbers of people who eat kosher are vegetarians and people who have food allergies. 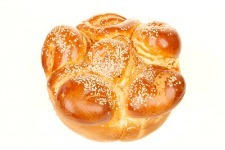 You may not know this but Muslims are the second largest religious market for kosher foods. Preparing your food according to Kashrut and obtaining a Kashrus Certification from a supervising Rabbi are essential to success. This niche of business catering from home start up is gaining in popularity. This is the fastest growing business catering from home start up niche. Nearly 7% of Americans and a higher percentage of Europeans, Indians and East Asians call themselves vegetarians. 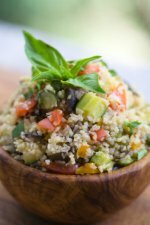 Today, vegan catering means preparing tasty dishes, like this tabbouleh salad, for instance highlighting the fresh vegetables natural flavors. Cooking using hearty grains like spelt and quinoa and a variety of beans starts you off on the right track. Because vegetarian means different things to different people, it is a must that you chat with your client to identify and clarify the definition of vegetarian /vegan and what is expected. A great resource to check out is vegan.org . A valuable business catering from home start up marketing tool is highlighting your business as using only organic foods. In the US, the National Organic Program (NOP) was enacted by federal legislation in 2002. Please see the three levels of “organic” on the NOP Website . To check on your potential competition, enter into your browser organic catering followed by the name of your city or town. Mobile catering sales now exceed 10 Billion Dollars a year worldwide. It is recession proof and may be started on a shoestring budget. You can go whole hog and purchase/lease a mobile business catering truck, a simple food cart or, like many entrepreneurs do, obtain a mobile concession stand and travel around the country visiting festivals and fairs. This business catering from home start up niche is probably the most crowded with competition. Secondly, businesses buy on perceived value. Therefore, catering corporate events generally allows for increased margins and profit for you. The KEY for any prospective business client is they want the event to come off flawlessly! This client is more concerned with this than the price. You must deliver the goods!! If you enjoy BBQ and have a tasty recipe, it’s time to go on the road. 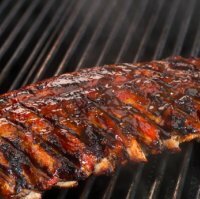 Not many barbecue business-catering companies include smoked BBQ on their menu. While this is a modest investment, considering the lack of catering competition and the potential return, to make this size of investment, you have to be committed to the business. BBQ catering is always a hit. Smoked BBQ is a super marketing tool that will draw clients. There are a number of other business catering from home start up niches. Some include: party catering, event catering, children’s party catering, beach party catering, themed catering, fund raising catering, holiday catering, etc., etc., etc. In any event, business catering from home start-ups requires committed focus and a demanding eye for detail. Not only must the product you serve taste delicious, be artistically and beautifully presented and exceed the expectations of your client, but you must be on or under budget to have a successful business. The saving grace in all this is that running a successful catering business can be highly profitable, really profitable. As with any successful business, your business catering from home start up requires hard work and unconventional business hours. With every catering event you book you are essentially setting up and taking down a restaurant. In the beginning, you fight for every catering event. When you're successful, you can target the events, cuisine and clients that appeal to you. To be in the know before you go is paramount to success. Get a great start with a solid, simple to do business plan . This planning resource is not a long complicated task. Use it as an outline of the boxes you need to tick for success. Your potential customers search the Web instead of the phone book. They want more information immediately. They don't want to spend 10 minutes on the phone asking you questions. So, they generally search for local caters by typing in the name of your town/city followed by the word "catering." This your window to your marketplace. If you do not build a "business website" rather than just a website, you will not get found or ranked high in the search engines. I use and recommend to my clients a company called Solo Build It. SBI is the only company that over 40,000 entrepreneurs use in building their own business website. SBI is the only company to have its methodology offered in courses at over 30 colleges and universities. I chose SBI because I had no website building knowledge whatever and they held my hand step-by-step. Thank you for visiting Business Catering from Home Start Ups.